The Astronomer, June, and I enjoyed our Maui getaway so much last summer that we vowed to return to the islands sooner rather than later. When airline and hotel prices looked promising earlier this year, we took the plunge and planned a trip to “The Garden Isle,” Kauai. As soon as the plane landed in Kauai, I wanted to eat all the poke. After we collected our luggage and secured the rental car, we made our way to nearby Fish Express. 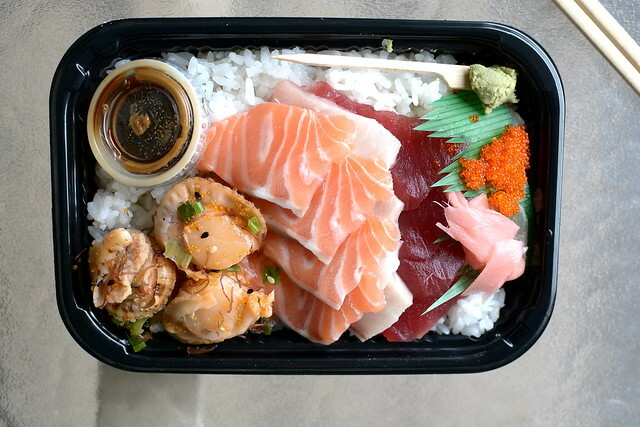 Both The Astronomer and I ordered poke bowls (the spicy ahi with crab was excellent), while June picked out a pre-made bento box with fried shrimp and Spam (that’s my girl). There was no seating on the premises, so we ate in the car on the way to our hotel in Poipu. Fun fact: Fish Express had a toppings bar with edamame, seaweed, and the like. 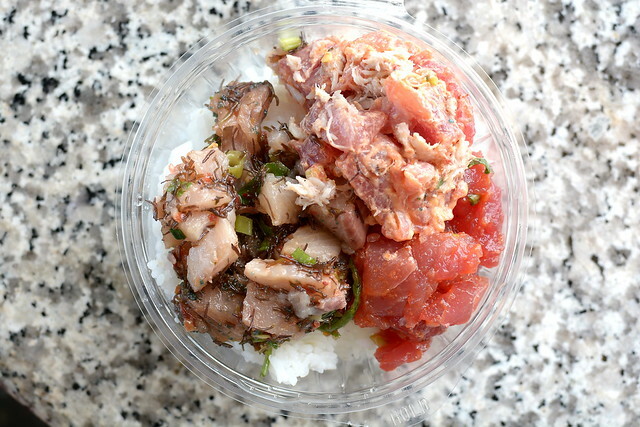 While toppings are a mainstay at mainland poke shops, this was my first time seeing it in Hawaii. As bad luck would have it, I got a killer migraine headache on our first full day on Kauai. 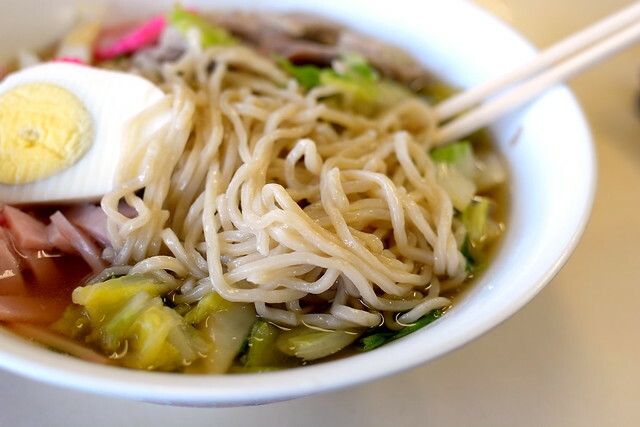 Noodle soups have a way of healing all ailments, so we drove a bit out of the way to Hamura Saimin. Here at this local institution founded in 1951 by Aiko and Charlie Hamura, we indulged in chicken and beef skewers, the famous saimin with all the fixings, and a slice of lilikoi (passion fruit) chiffon pie. Quite possibly even better than the food was the vibe of the place. I highly recommend Hamura, whether you’ve got an ailment or not. 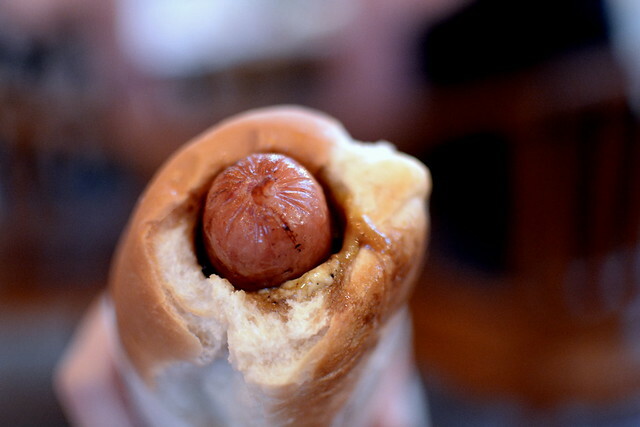 Billed as a Hawaiian-style hotdog, Puka Dogs consist of grilled hotdogs or polish sausages encased in toasted Hawaiian sweet bread along with a sweetish sauce of one’s choosing, like Aunty Lilikoi’s Hawaiian mustard. Puka Dog provided a fast and tasty-enough meal not too far from our home base. I loved how on Kauai there was an abundance of mom- and pop-run markets. 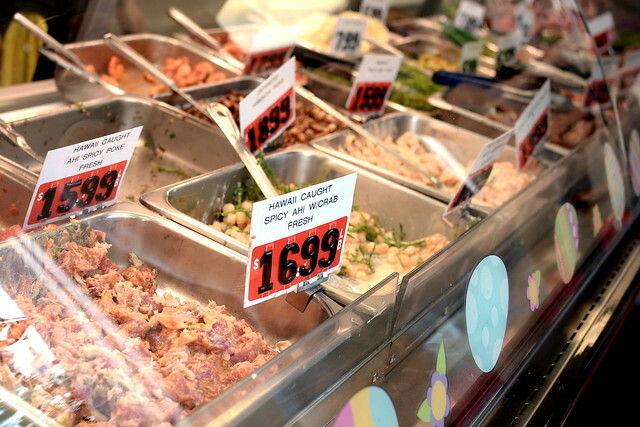 While some specialized in prepared hot foods, others were better known for their poke and sashimi selections. One of my favorites was Konohiki. The chirashi with scallops, salmon, yellowtail, tuna, and tobiko was stunningly fresh. 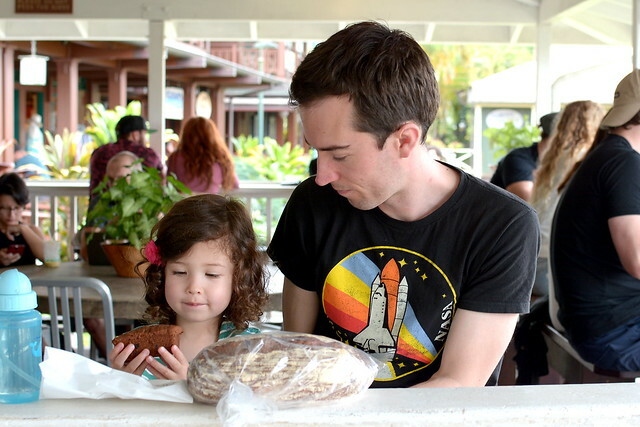 On our day-trip to Hanalei, we swung by the Bread Co. for our fill of carbohydrates. June selected a vegan quick-bread that was really quite good, while I got a loaf of country bread to enjoy for the rest of the week. I desired nothing more than a burger at Duane’s Ono Char-Burger in Anahola following our morning in Hanalei, but alas, it was closed for one reason or another. Crushed but still hungry, we stopped by Pono Market for a quick bite since we had a napping toddler in the car. 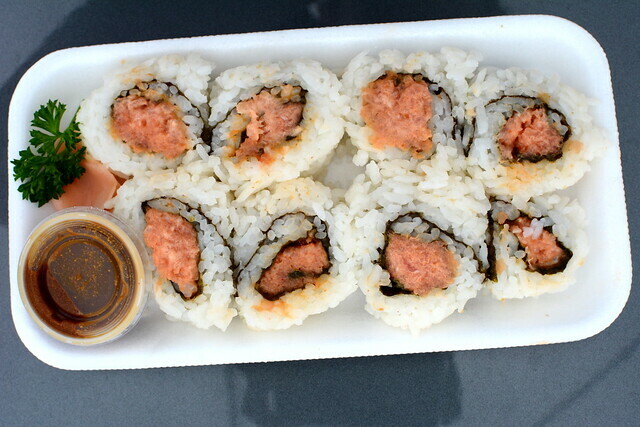 The spicy tuna roll was simple and good. 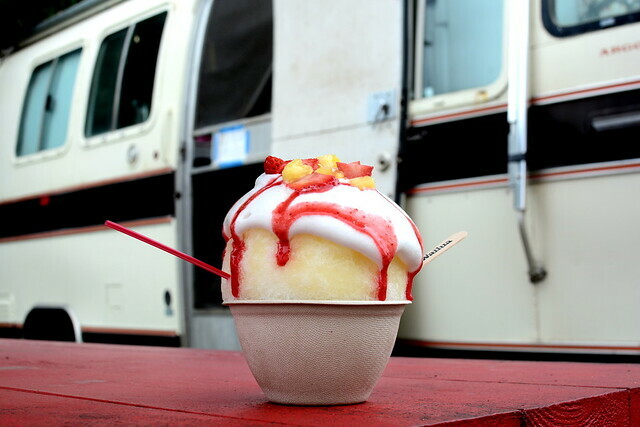 Located a stone’s throw from Pono Market was an adorable converted motorhome selling shave ice. I selected the “Lava Flow,” which included pineapple juice, strawberry puree, pineapple and strawberry fruit topping, and best of all, “coconut foam.” I refuse to have shave ice without coconut foam from here on out. 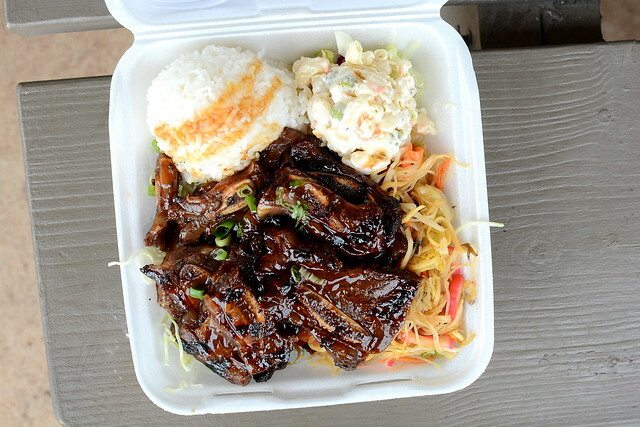 Mark’s Place is known for its filling and satisfying plate lunches. We probably should have known better than to order two plates between the three of us, but alas, we couldn’t help ourselves. 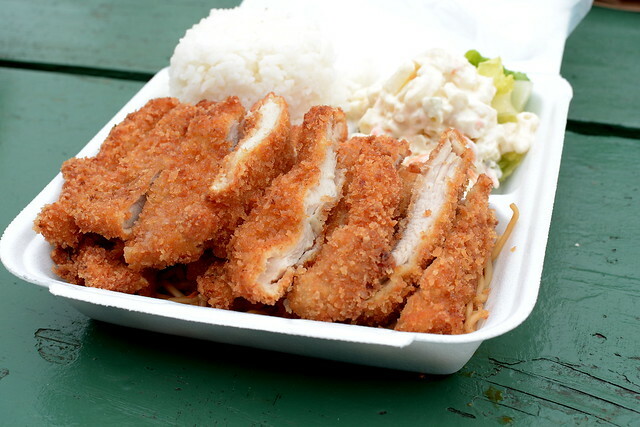 The chicken cutlet plate, which included white rice and potato macaroni salad, was expertly fried but under-seasoned without the accompanying sauce. 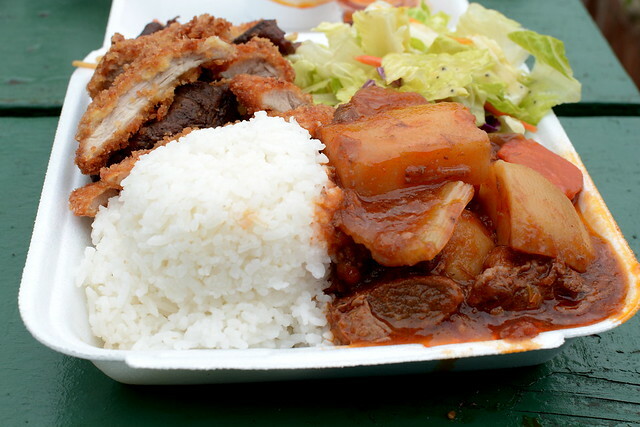 The Astronomer’s “Famous Mixed Plate” delivered a trio of proteins: chicken katsu, teriyaki beef, and beef stew. After eating a lot of seafood throughout the week, most of it raw, it was pretty awesome to eat all the meats. Aloha Sweet Delites provided us the only malasada of our stay. It was a fine-enough specimen, but nowhere near the excellence of our dear friend Leonard on Oahu. 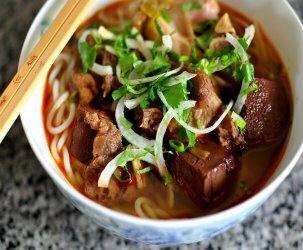 Whereas most of the mom and pop markets that we visited specialized in either hot or cold foods, Ishihara Market, which has been around since 1934, masterfully excelled at both. 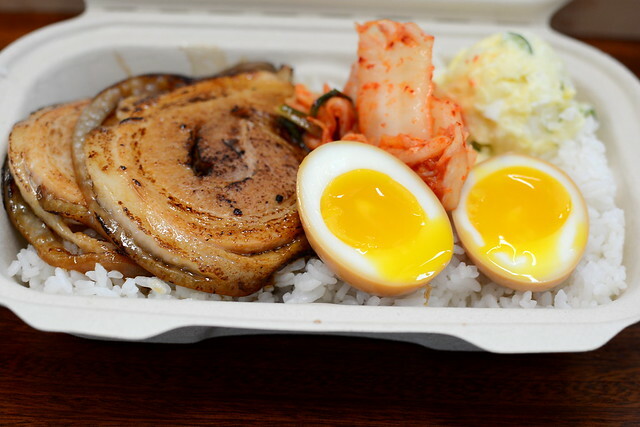 The saucy kalbi plate lunch was finger-lickin’ great, as were the salmon and tuna pokes. Since June napped through the first shave ice stop, we had to make it up to her at Loco Coco. 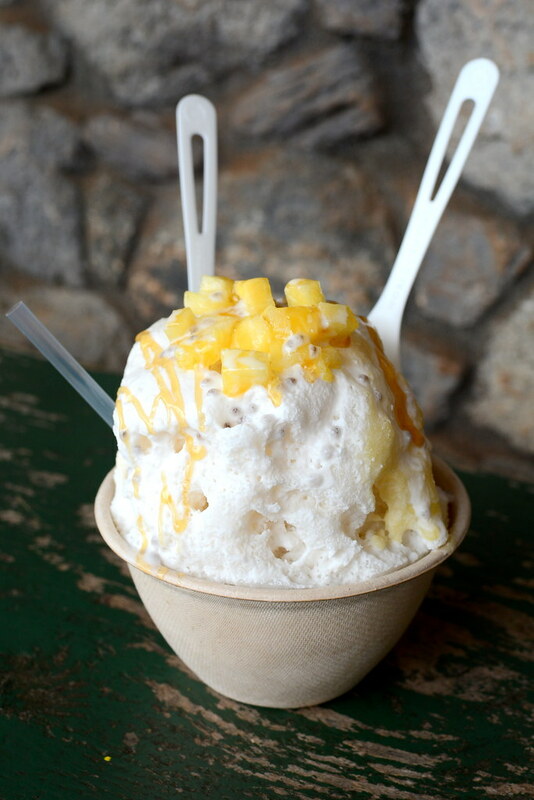 We shared the “Coco Pine,” which consisted of coconut and pineapple syrup-topped ice with fresh pineapple, coconut cream, and local honey. Before boarding the boat for a tour of the Na Pali Coast, we stopped in to Midnight Bear Breads to see if their Macadamia Nut Cinnamon Roll was as good as everyone said it was. 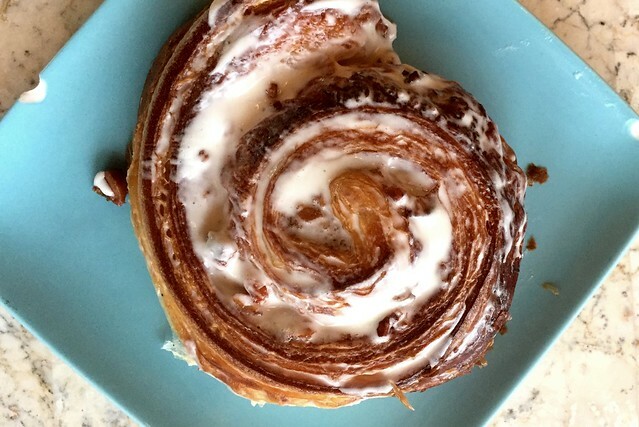 Gloriously flaky and generously iced, the cinnamon roll delivered on all fronts. If the bakery weren’t so out of the way, I would’ve returned daily to sample more of its offerings. 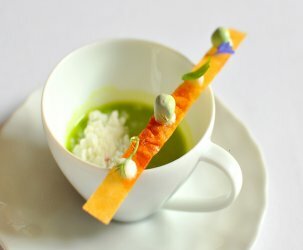 Three words: Avocado. Ahi. Poke. Three more words: Go. Eat. It. …The Astronomer and I polished off a bowl of ramen each. 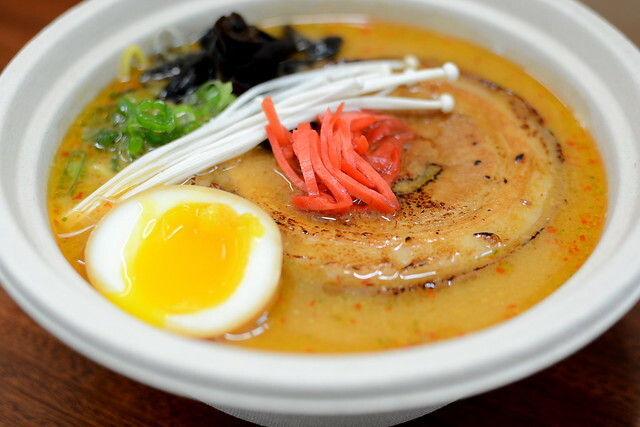 We tried the Butteryaki (“a contemporary shoyu tare finished with butter to smooth out the shoyu’s sharpness”), as well as the Spicy Miso (pictured above). Needless to say, we waddled onto the homeward-bound plane. Thanks for feeding us well, Kauai. 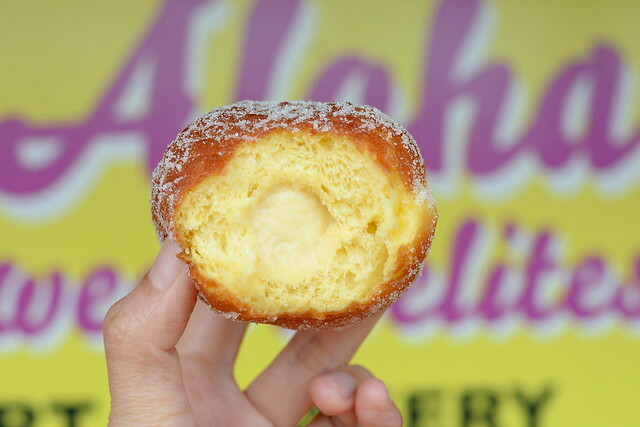 Honolulu Sweets: Shave Ice, Fancy Cakes, Cream Puffs And More! What great timing! 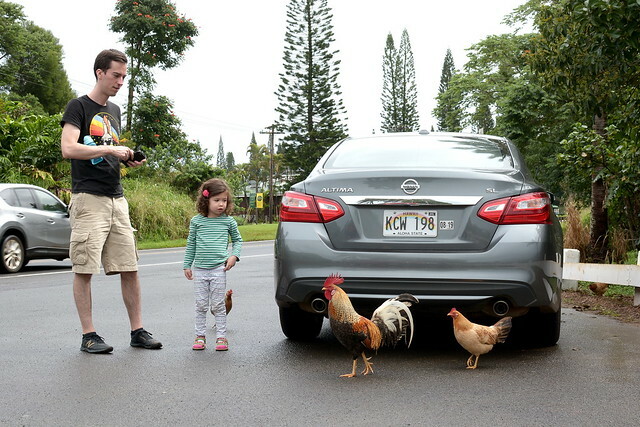 I’m headed to Kauai next week for the first time with my two toddlers. 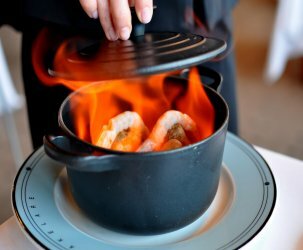 I’ve read your blog for a few years and always enjoyed it, but never had the chance to try any of the restaurants you write about. No longer! Love it when that happens! Have a great vacay, Chad. Eat well. – The Plantation Train Ride was loved by the whole family: //www.kauaiplantationrailway.com/ Interesting fact learned on that ride… The island has no natural predator for the chickens, hence why there are so many. Also, those layered trees called Albizias fall over quite easily and cause a good amount of property damage. I guess the tree was so pretty when first introduced to the island that people started spreading it quickly. Only many years later after the trees matured did everyone find out the bad news. – Malasadas (and all the baked goods) at Aloha Sweet Delights were sooo good. We also loved their cinnamon roll and ensaymadas! – On the drink side, Lava Flows. I guess it was also the name of your shaved ice, go figure! Ours were from the Marriott in Poipu. – The Chai Lattes at The Little Fish stands were spot on. 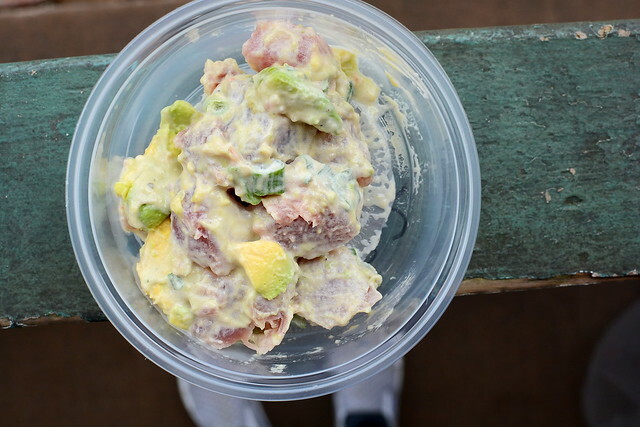 – The Avocado Poke at the Koloa Fish Market was good, but I really enjoyed their Lau Lau.